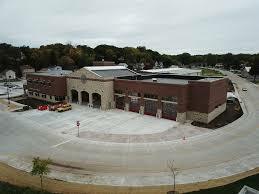 The Kaukauna Fire Department is committed to providing a safe and healthy community for both citizens and business by minimizing fire loss through sound fire prevention efforts, competent suppression techniques and efficient emergency medical care. Kaukauna — The Kaukauna Fire Department responded this morning, at approximately 4:45 am to a fire at 600 Thilmany Rd. When crews arrived on scene they found a coal hopper with approximately 40 tons of coal on fire. Access to the storage hopper was limited but, firefighters were able to direct hose-lines onto the fire. The fire response team from the Thilmany Plant assisted the Kaukauna Fire Department with extinguishing the fire. No damage was done to the facility and no injuries occurred. The loss was limited to the supply of coal on site which is estimated to be worth $3,000. The Ahlstrom-Munksjö Thilmany Plant remained in full operation during the incident. City of Kaukauna Fire Department shared a photo.